Home decorating with LED lighting is growing more common as consumers recognize the versatility of this relatively new type of lighting. It is adaptable to a variety of home decorating uses since it comes in many forms such as strips or bulbs and is available in all the hues of the rainbow. A real bonus is that LED bulbs last up to 25 times longer than incandescent bulbs and use less energy than incandescent bulbs, resulting in lower electricity costs. The best news about Led lighting is that it can be used in numerous ways to enhance the appearance of any commercial or residential space. 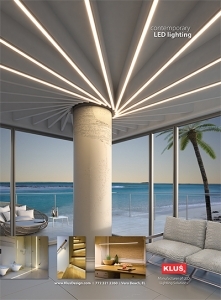 • Install strip lighting above the crown molding of a room or place it along any ceiling decorative accents. Similarly, strip light can be installed along baseboards as an interesting lighting feature. • LED recessed lights can replace ordinary pot lights in any ceiling to brighten a room. • Kitchens offer many opportunities for use of LEDs. Use the lights under upper cabinets to light counters and along ceilings. Hang interesting pendant lights over islands and peninsulas, and great LED chandeliers over tables or in entryways. • Use LED spotlights to accent decorative elements of any room such as art, plants, or figurines. • Put LEDS beneath furniture to add interest to your design. The lights can be purchased in numerous colors, made to change color and can be dimmed and brightened. Some lights can be controlled by a smartphone that change color, intensify, or turn on before you go inside your dwelling. • LED lights are especially useful in stairwells. LED pot lights in the ceiling above a staircase or along the edges of the steps increases safety as well as beauty. Home decorating with LED lights, using some of the ideas above, is an imaginative way to beautify your home. Don’t forget to use LEDs to bring excitement to your yard and house exterior.